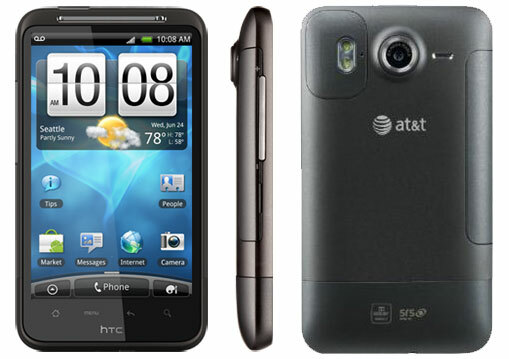 AT&T gets a compelling Android phone in the HTC Inspire 4G. With a beautiful 4.3-inch display, high-quality 8MP camera and mobile Wi-Fi hotspot, the HTC Inspire 4G will fulfill most needs. It’s missing a front-facing camera and it’s on heavy side (5.8 oz), but at $99, it’s a great deal. The HTC Inspire 4G is a big, heavy phone. Thankfully, its rounded edges make both less of an issue, even for my small hands. The fit and finish are typical HTC—minimalist with a nice textured finish. The lens for the camera sticks out from the back, which means it's a magnet for scratches and it makes the phone unstable when you lay it down for use on a flat surface. Granted that doesn't happen often, but the rocking that ensues when you do is annoying. Finally a pet peeve with cell phones is the bottom headphone jack. Not a deal breaker, but annoying when you try to set it down on an elliptical machine. The HTC Inspire’s 4.3-inch 800x480 capacitive LCD touchscreen is bright and sharp, which makes a big difference when it comes to web browsing and reading ebooks. It’s not quite as bright as the Super AMOLED displays found on the Samsung phones, though. Sound from the built-in speaker is average, despite Dolby Mobile and SRS enhancement. The equalizer, that works with headphones, delivers better than average sound. The AT&T network isn’t great in New York City, but for the most part the HTC Inspire 4G didn’t have trouble making calls and sound quality fine. Technically, the HTC Inspire 4G is not true 4G because it operates on AT&T’s HSPA+ network. However, AT&T claims HSPA+ is capable of supporting 4G speeds. In actual testing in New York City, I was unable to reach 4G speeds, often maxing out between 1-2Mbps per second. Other reviewers have cited similar problems. Hopefully, as the AT&T HSPA+ network gets built out, we'll see those speeds improve. The extra real estate provided by the HTC Inspire 4G’s 4.3-inch display makes browsing the web a pleasure. The phone runs Android 2.2, as are most new Android phones, and that means support for Flash. The HTC Inspire 4G can act as a mobile hotspot for up to five devices. Using the hotspot means opting for AT&T’s most expensive data plan, $45 for 4GB per month. The HTC Inspire 4G has an 8MP camera with an LED flash and takes 720p HD video. There’s no front-facing camera for video chat. The camera quality was above average for a cell phone, with images in bright light showing impressive detail, true colors and a nice crispness. In low light, noise does creep in, but that’s to be expected. Video quality was average, with the usual motion blur and low light noise issues. There are an impressive number of controls for the camera. There’s face detection, self-timer, white balance, ISO, Geo tagging and adjustments for exposure, contrast and saturation. The self-portrait mode uses the camera’s face detection to find your face and then the self-timer, so you can be ready with a smile. In testing it worked well. There are also 12 fun effects, including distortion, vignette, vintage and negative. With its 4.3-inch display, the HTC Inspire 4G's keyboard is wide enough for easy thumb typing when held vertically and spacious when held horizontally. There’s also haptic feedback for those that like it (I prefer it off). Navigation is similar to other Android phones, with seven panels, each customizable with various widgets and apps. There’s a personalize button on the home screen that provides easy access to changing the look, sound and layout of your phone. In particular, you can set up scenes, or custom screen layouts, for home, work, the gym, travel whatever you want. You can also now save your settings and controls to an HTC Sense account, making it easier to switch to a new phone in the future. There are only two physical buttons, power and a volume control rocker. The rest are touch. It would have been nice for the dedicated touch buttons to be more visible when they aren’t backlit, but once you’ve learned the layout, they’re easy enough to use. The HTC Inspire 4G comes with 4GB of internal memory plus an 8GB microSD card (expandable to 32GB), which should be plenty for most people. Battery life is average, lasting through a day of normal usage. The HTC Inspire 4G is available with a new 2-year contract at AT&T and RadioShack for $99.99 and at AmazonWireless.com for $69.99. The HTC Inspire 4G is a great phone for AT&T customers at a good price. It offers most of what you’d want in an Android phone, a 4.3-inch display, high-quality 8MP camera and mobile Wi-Fi hotspot. The drawbacks are a very slow 4G experience, no front-facing camera and it's above average in weight (5.8 oz). Its main Android competitor on AT&T is the recently released Motorola Atrix. The Atrix has smaller 4-inch display, weighs in almost an ounce lighter, has a front-facing camera and has computer-like speeds, with its Nvidia dual-core Tegra 2 processor. It’s also twice the price. You won’t go wrong with either phone, but the HTC Inspire 4G is the better value.